Boil peanuts in salted water until fork tender, but not mushy. About ten minutes Alternate: Add 2 cups of water, and salt to peanuts. Pressure cook for 8 minutes. Prepare dressing: Whisk together olive oil, lime/lemon juice, salt and pepper. Once peanuts are cooled, add to chopped vegetables. Pour the dressing over; add more if needed. Garnish with cilantro Refrigerate until ready to serve. If making ahead, cut up all the vegetables except onions, if using, and store them in different ziploc bags or containers. Salad dressing should be added a couple of hours before serving to retain crispness of the vegetables. Go wild with your imagination and pretty much add any fruit/vegetable that will hold its shape, is mild in taste and can be cut up uniformly! 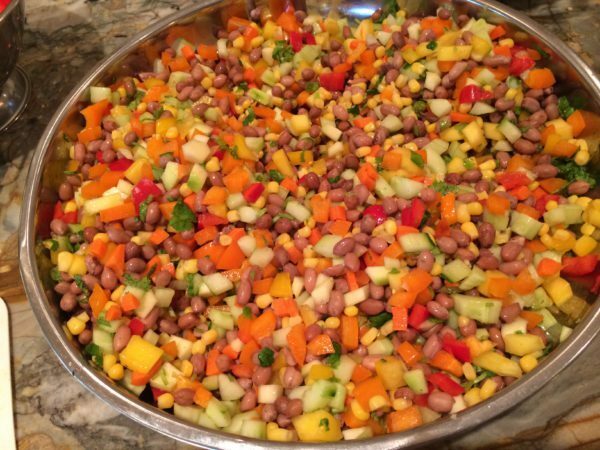 This is my most requested potluck/party salad, and how much ever I make, I always run out!